Home »Massage»Deep Tissue Massage»Don’t let muscular aches and pains get you down. We offer a range of Massage to suit most peoples preference. We have three highly trained massage therapist who offer their own unique skills to to the type of massage they perform. When there is chronic muscle tension or injury, there are usually adhesion’s (bands of painful, rigid tissue) in muscles, tendons, and ligaments. 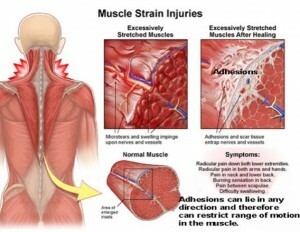 Adhesion’s can block circulation and cause pain, limited movement, and inflammation. Deep tissue massage works by physically breaking down these adhesion’s to relieve pain and restore normal movement. To do this, the massage therapist uses massage oil and often uses direct deep pressure. Muscles must be relaxed in order for the therapist to reach the deeper musculature. Day 1–you get a massage. It feels great, everything is loosened up, even if some times the massage was painful (in a good way). you feel a little tired or slightly loopy. Dy 2– You wake up in the morning feeling like a truck has run over you. You check under the bed, no truck… it must have been the massage. You feel stiffness in the limbs that were worked and tightness or fullness in the specific muscles that were massaged. you may even feel slightly sick if you have never received massage before, or if you smoke cigarettes or drink a lot of alcohol on a regular basis. You take a hot shower, ice the swollen areas, and drink lots and lots and lots of water. You may even take an ibrofen if its just to much to bear (this is extreme). Note: even though the surface of your body may feel sore and tender, you should not be bruised. Bruising is not required in deep tissue massage to get the muscles to release, and it is usually a sign that your massage therapist went too deeply, too quickly into your muscles and surrounding tissue. Next time, tell your therapist about the bruises, and make sure that they know that that is not okay. The exception to this is if you are susceptible to bruising easily. A lot of women in particular tend to bruise very easily, as well as people who are taking blood thinning medications or who have certain health issues. Please let your therapist know before the massage that you think you may bruise and she will be able to take that into consideration during your massage. Day 3– you feel fantastic! Everything that hurt yesterday feels much better. The swelling is gone, and with it, went the pain. You drank 16 gallons of water and you feel ready to run that marathon you haven’t started training for yet. You have range of motion back in that previously tight body part, you can stretch it further, and it somehow even feels stronger. If it has been a long-term chronic issue, it may not feel 100 percent cured, but it should feel significantly better than before the massage. As far as any other feelings of discomfort, you should feel free to contact your massage therapist if you have symptoms that you are worried about. If you received a full body massage, there are a lot of effects and benefits that you may experience, and your individual cocktail of pain versus bliss just depends on your daily lifestyle, overall health, and what you put into your body. If you have chosen a conscientious and well-informed massage professional, they should know how to answer your questions and help resolve your issue.